What a fabulous venue the Crown & Mitre Hotel Ballroom is for a festival and that’s where it all kicked off in style on the Friday night. 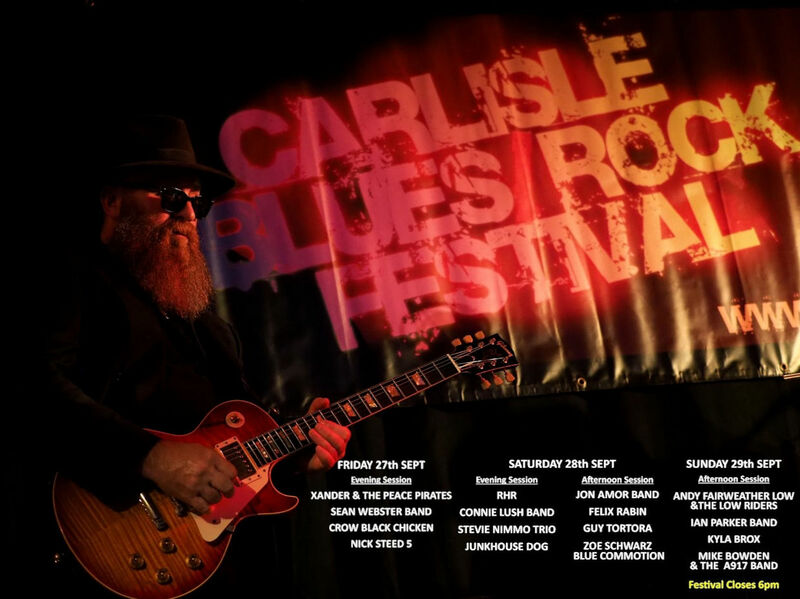 First to take the stage were ‘Redfish‘, an accomplished, tight blues band and local to Cumbria. An excellent start to the weekend with their blend of traditional rhythm & blues, roots and soul. With a wild man on keys they gave great entertainment. Brian Harris fronts the band on vocals, Martin McDonald on excellent guitar and slide guitar, Fraser Clark on keys, Rod Mackay on bass and Sandy Sweetman on drums. Always a pleasure to see the next band, the impressive ‘Chris Bevington Organisation‘. From the Stoke area, they are certainly a band with a ‘big’ sound. As a nine piece collective, they played a mix of blues, rock, soul and jazz with many tracks taken from their three impressive albums. Fronting the band on great vocals and guitar was Scott Ralph, today they were missing their other front man, Jim Kirkpatrick who was replaced by a young guitar wizard. With keys, trumpet, sax, bass, drums and backing vocals, the big band sound was full on, excellent! A young lady who is on fire, ‘Elles Bailey‘ and her band certainly caused a stir. Her music is described as ‘rootsy blues, country, and soulful rock, with a contemporary edge’. An absolutely stand-out performance with fantastic raw vocals and exceptional musicianship from the whole of the band. She showcased many of the tracks from her outstanding album ‘Wildfire’. The final band for the evening was the award winning ‘bluesman’ ‘Ian Siegal‘ and his band. With a mix of blues, roots, Americana and country, the set was probably one of the best I have heard from this exceptional contemporary blues man. Struggling with a strained wrist, didn’t detract from the performance and he was well supported by his band with another guitar talent in Dusty Ciggaar. Saturday Opening the afternoon for us were ‘The Deke McGee Band’. Certainly rockabilly and saxophone lead ‘small big band’ sound, with upright bass, guitar, drums, keys. Fronting the band on vocals and saxophone was Mark ‘Deke’ McGee, who started playing the sax at the age of thirteen. Deke has performed all over the world and shared the stage with many a famous name. The set was certainly rockin’ with a classic 50s’ and 60s’ feel. Shrewsbury based ‘Rainbreakers‘ next. They played a superb set with a mix of self penned blues, rock, funk and soul going from strength to strength with faultless musicianship. Fronted on excellent vocals and guitar was Ben Edwards, with brother Sam Edwards on drums and Peter Adams on bass. Charlie Richards, who has just turned twenty two, played with the most amazing ‘feeling’ on lead guitar, that I have heard for a long while and was probably the highlight of the band in this set. ‘The Stumble‘ closed the afternoon session with their superb Chicago style blues. Fronted by the charismatic Paul Melville on excellent vocals, Colin Black on exceptional lead and slide guitar, Simon Anthony Dixon on super sax, Ant Scapens on guitar, Cameron Sweetnam on bass and the powerhouse of Boyd Tonner on drums. Playing a repertoire of old Stumble classics from previous albums plus material from the excellent current album ‘The Other Side’, they certainly gave it their all, with a worthy performance, putting the Stumble in a class of their own. Just brilliant! After a break for tea, the evening session kicked off with local buskers ‘Jon Bowie and Phil Saunders‘. Playing as a duo they provided a great opener for the evening session. A big ‘wow’ for ‘Northsyde‘ laying down a mix of rock, blues and funk. With the gorgeous Lorna Fothergill on superb vocals, who can certainly strut her stuff, Jules Fothergill playing impressive guitar and slide, ably supported by Ian Mauricio on outstanding bass and Hayden Doyle on drums. A low-down and gritty performance with a mix of rootsy blues and a dash of raw rock were the order of the day. A blast from the past in the form of ‘Mike Vernon & the Mighty Combo‘ now graced the stage. Mike was renowned in the 1960’s as one of the eminent producers, having been involved with many of the greats. The band are an impressive bunch of high-class musicians, with Mike Vernon on lead vocals, Kid Carlos on guitar, Ian Jennings on upright bass, Mike Hellier on drums, Matt Little on keyboards and Paul Tasker on saxophone. They played a mix of upbeat traditional rhythm and blues with rock ‘n roll boogie and swing. A great big band sound with super vocals from Mike, showcasing their debut album ‘Beyond The Blue Horizon’. To finish off the evening, were the highly acclaimed Danish band ‘Thorbjorn Risager & The Black Tornado‘. As a seven piece with brass and keys they were fronted on main vocals and guitar by gruff vocals of Thorbjorn Risager. Playing a mix of blues, Americana, boogie with a dash of funk they certainly provided great entertainment with great musicianship from the whole band. SUNDAY – Off to The Old Fire Station venue in Carlisle for the last day of this excellent festival. A new band to me and an up and coming talent from London, the ‘Tom JJ Band‘, played a mix of Chicago style and hot Texas blues. A favourite performer next, the well-seasoned UK based, Detroit’s soulful blues-rock star Marcus Malone, fronting the ‘Malone Sibun Band’. Playing a varied mix of blues, rock, soul and funk with great vocals from Marcus and some classic guitar playing from Innes Sibun, who has also been a high flyer with an international reputation. The last band of a the festival were ‘Todd Sharpville Band’ featuring ‘Wayne Baker Brooks‘ from the USA. With a ‘heads up’ for the late Otis Rush, Todd kicked off with some classic electric blues before he was joined on stage by Wayne Baker Brooks to complete, what had been a wonderful festival. Thanks goes to Nick Westgarth who worked tirelessly to put this excellent event together and to his team who worked so hard over the weekend. Thanks also go to the sponsors and especially to the bands who made this such a memorable occasion.